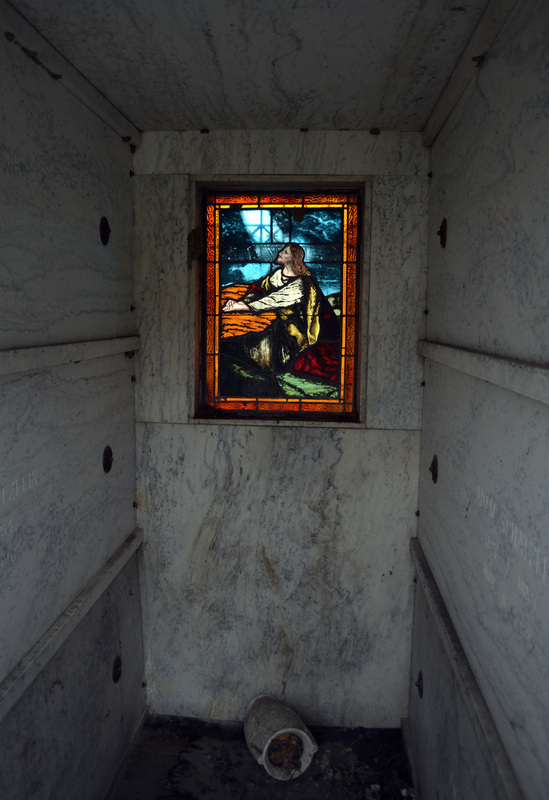 A mausoleum is an external free-standing building constructed as a monument enclosing the interment space or burial chamber of a deceased person or people. 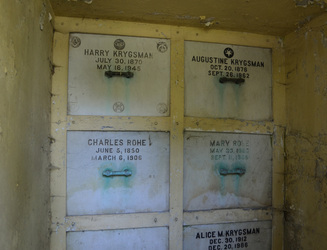 Forest Home Cemetery has many mausoleums. 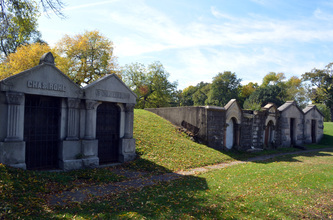 Located in Section 13 the Hillside Vaults are built into the "Oak Park Split". This area lies on top of the shore of the ancient, glacial "Lake Chicago." The long arm of beach gravel and sand that formed between Lake Chicago and the Desplaines Bay is known as the "Oak Park Split." 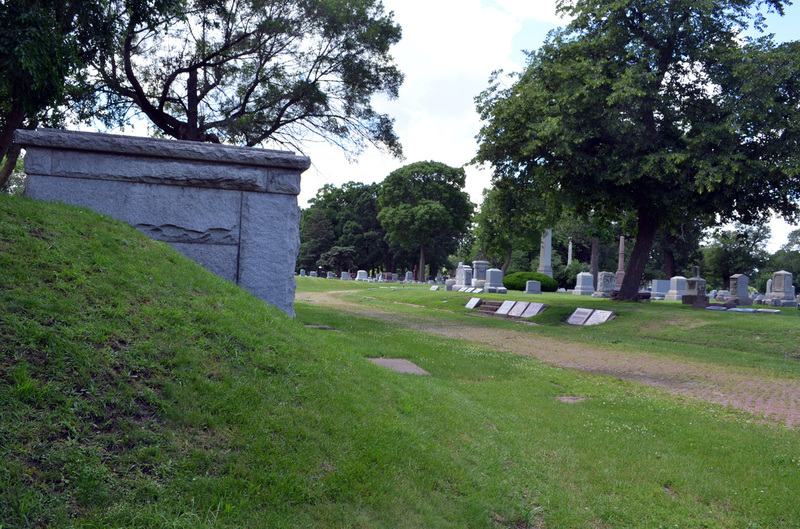 This ridge, which runs diagonally from Ridgeland and North Avenues to Madison and Desplaines where it levels out. 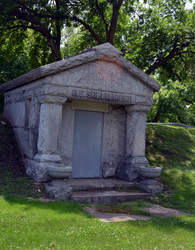 The Lehmann mausoleum located in Section O was once owned by Ernst J. Lehmann, who established The Fair, a Chicago department store, in 1875. 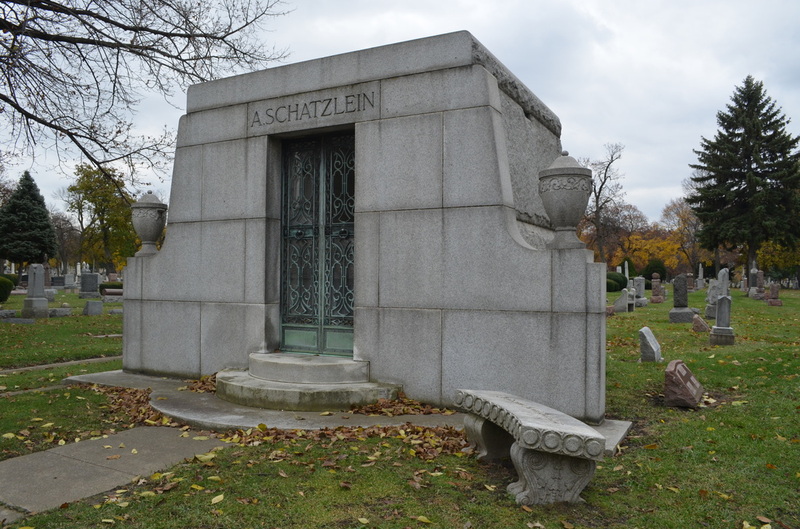 Born in Mecklenburg-Schwerin, Germany, in 1849, Lehmann came to America in 1858 and was considered a pioneer in the department store business. Legend has it that Lehmann had been a friend of the Haase family and helped them run the picnic grounds on this land before the cemetery was established. One account indicates that he may have piloted a pleasure boat drawn by geese on the Des Plaines River. Lehmann eventually suffered a breakdown, attributed to overwork, and he spent the last decade of his life in sanitariums, dying in White Plains, New York, on January 5, 1900. 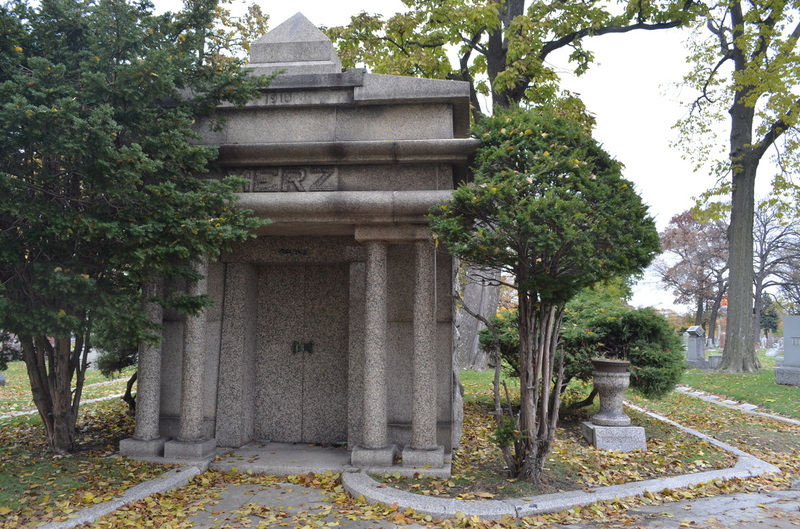 His son, Edward J., ran the business in his absence. 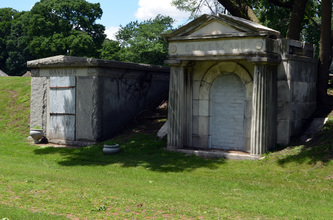 The Lehmann mausoleum is the largest mausoleum in the cemetery and today it stands vacant. 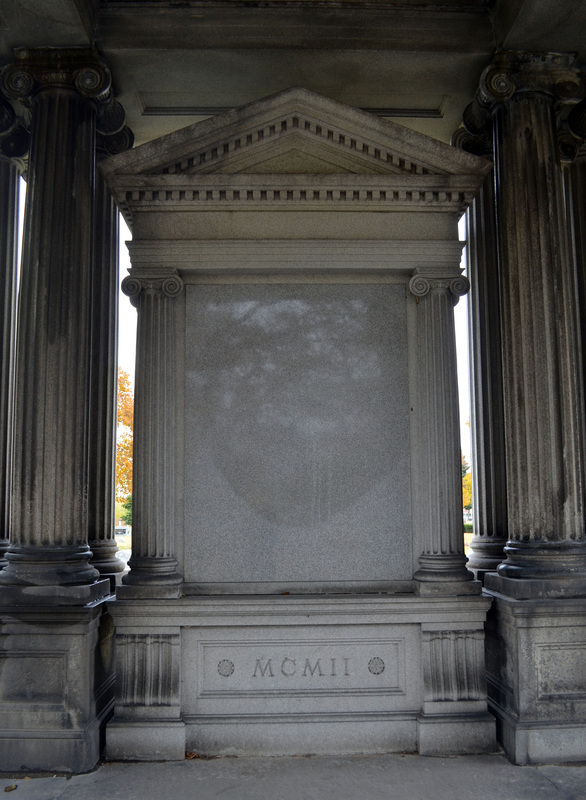 It has no inscriptions other than the date 1902 engraved in Roman numerals. 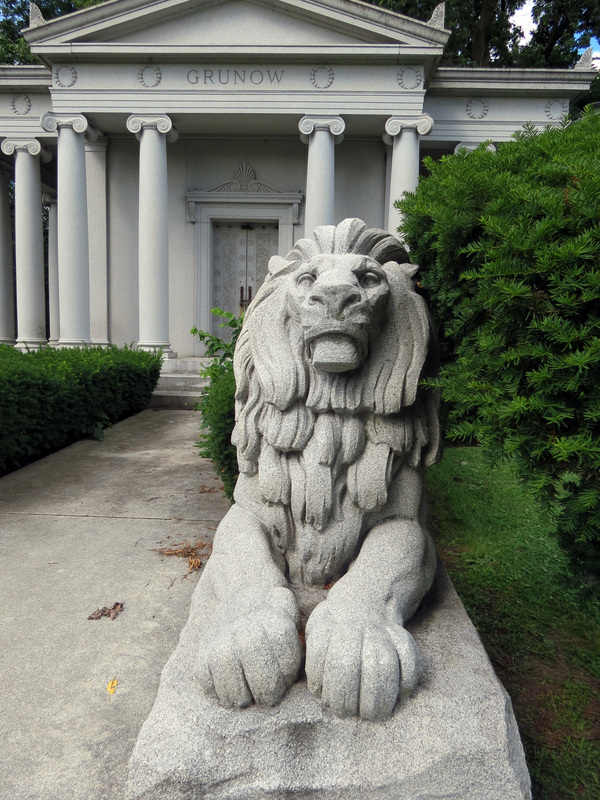 The mausoleum features pairs of Ionic columns while two stone lions guard the west-facing main entrance. 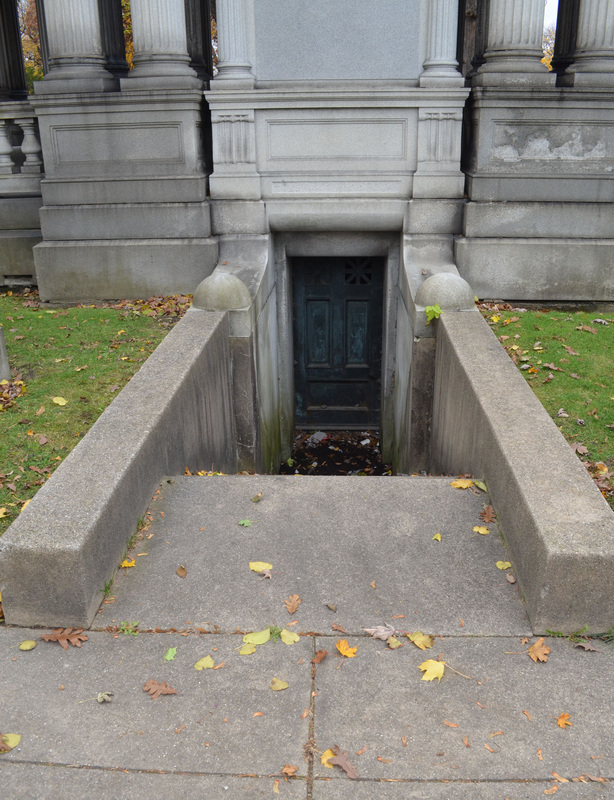 A staircase in the back wall leads down to a door that used to be open. Inside is a small and barren cellar, with the stout wooden beams above visibly sagging. 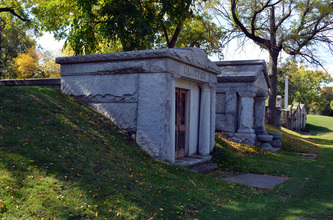 The cellar appears to be empty, with no crypts visible. 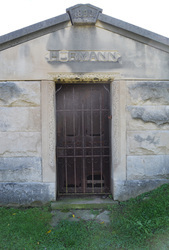 According to an illustration on a 1905 letterhead for German Waldheim Cemetery, "E. J. Lehmann Memorial" was carved along the roof line of the mausoleum. Originally, six bodies were buried in the mausoleum, but in 1920, they were all moved to an even more impressive mausoleum on an island in Graceland Cemetery in Chicago; the crypt has been empty ever since. The second largest mausoleum in the Forest Home Cemetery located in Section 24 was built for life-long Chicago resident, William Grunow, (born April 30, 1893; died July 6, 1951) a partner in the Majestic Radio Company. 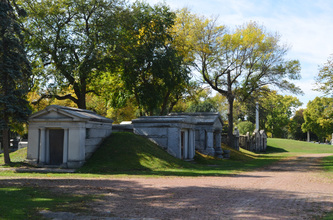 The pathway to the mausoleum is flanked by lions. The lion has long been a symbol of bravery, strength, and majesty. In popular culture, the lion is known for its power and is called King of the Jungle and King of the Beasts. 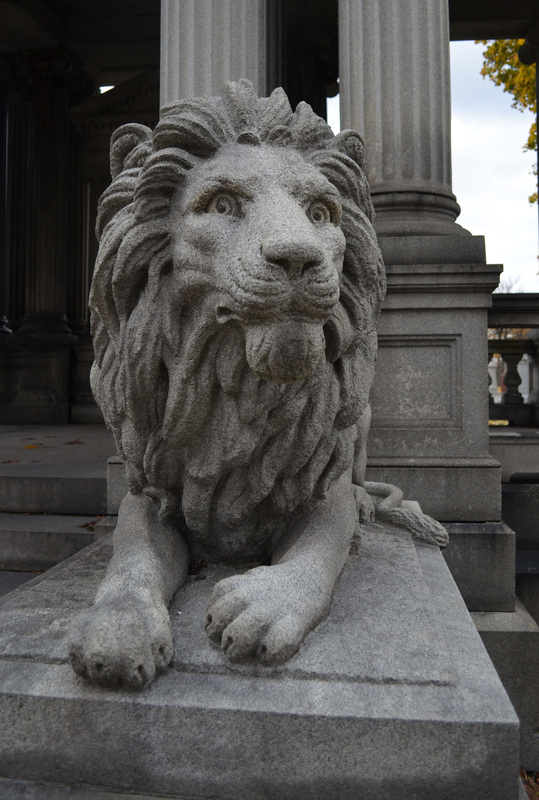 The lion is often used as a royal emblem, found eight times in the Royal Arms for the Queen of England alone! The lion in funerary art symbolizes the power of God. It is often depicted flanking the entrance of a tomb, as it is here, to guard against evil spirits to the passageway to the next realm. It also represents the courage of the souls the lions guard. There is also a connection of the lion to the Resurrection. It was once believed that lion cubs were born dead but would come to life after three days when the cubs were breathed upon by a male lion. The three days is significant because it is the number of days Jesus was in the tomb before he was Resurrected. The mausoleum design is of the Ionic order, one of the three organizational systems of Greek architectural design. 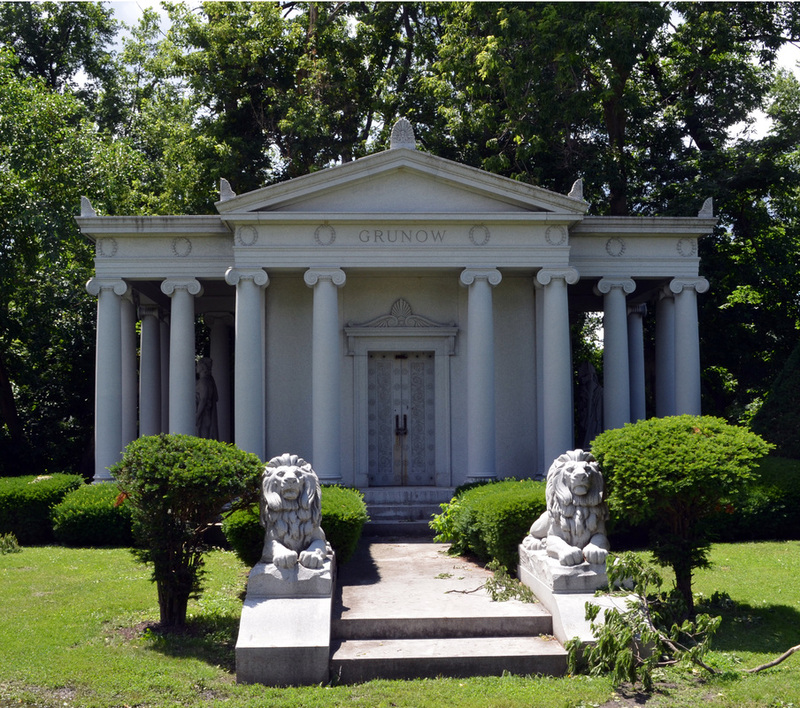 The Ionic order is characterized by the use of a capital (the top of the column) that uses volutes, a spiral scroll-like ornamentation. In this example, the capital is enriched with an egg and dart design. 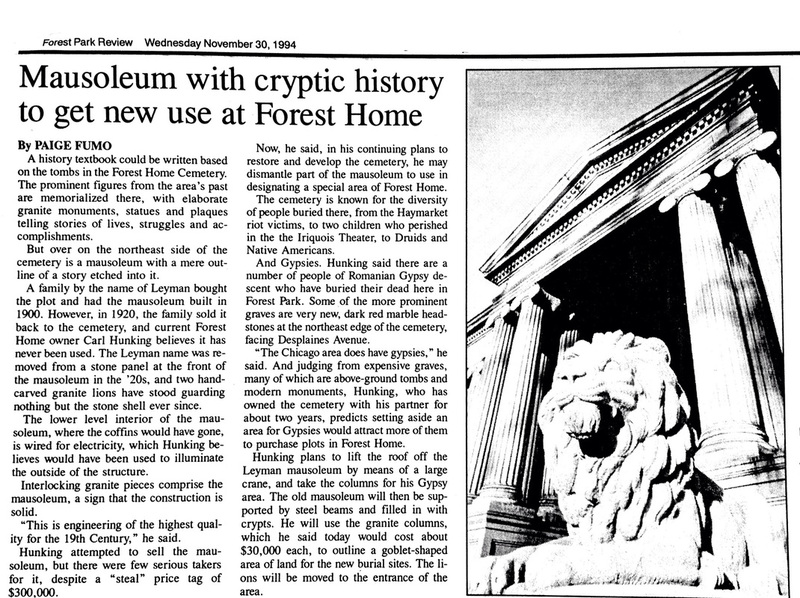 The Ionic column is slender and is often fluted. 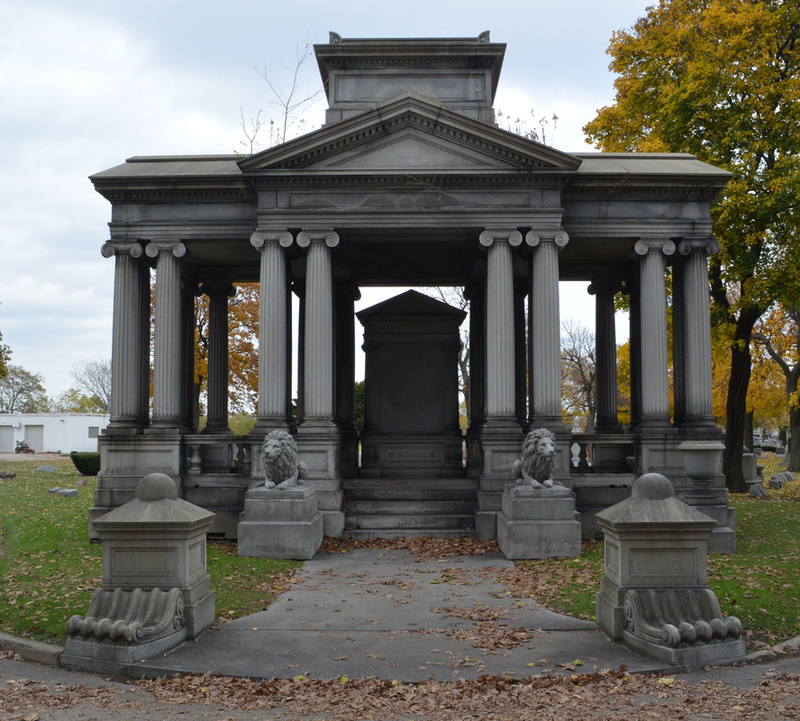 The entablature (architectural composition resting on the columns) is composed of an architrave (lentil or beam) which is plain and divided into two or three bands and rests directly on the column; a frieze (the widest band between the capital and the cornice); and the cornice. 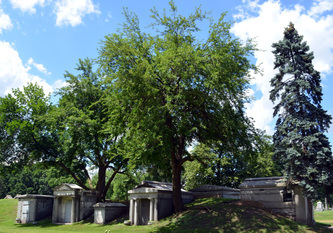 The acroterion, an acanthus stone work, is placed at the apex of the pediment and at the corners of the tomb which completes solemn tomb. 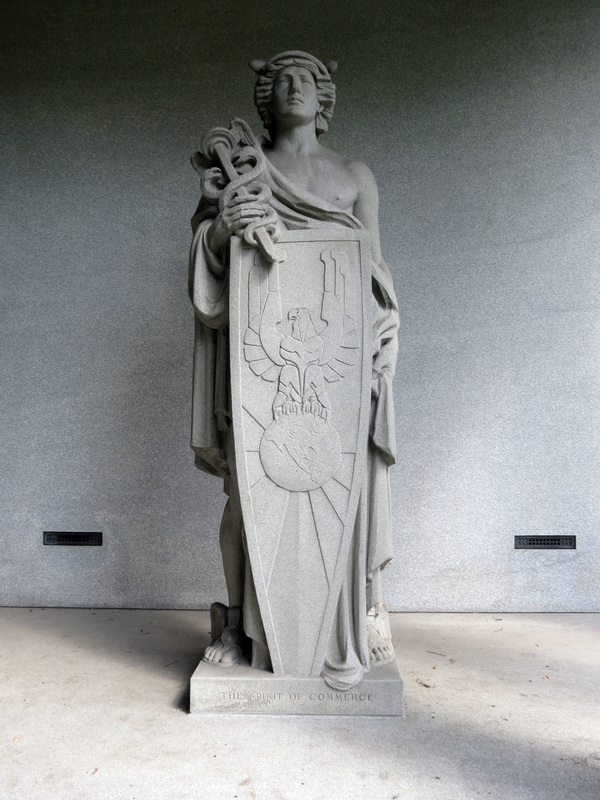 Underneath the opposite portico, is the statue of the Greek goddess of victory, Nike, carrying the palm leaf. 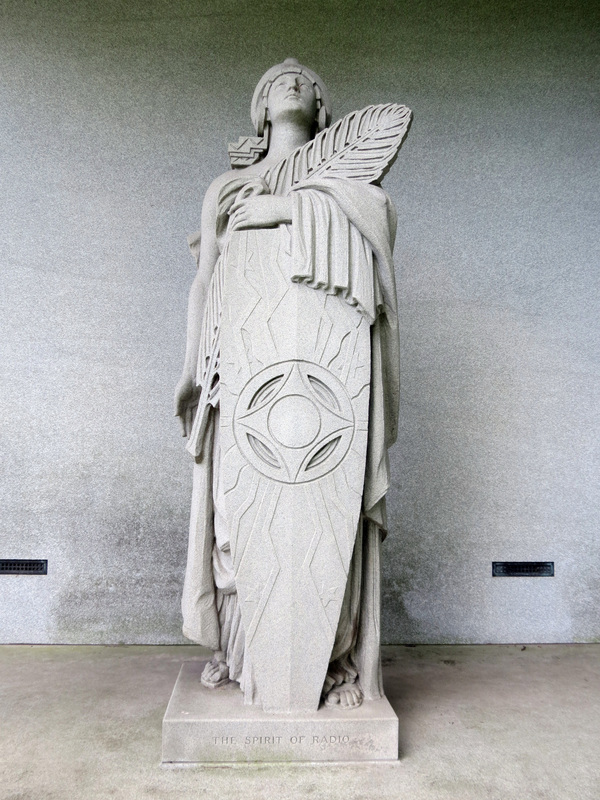 The base of her statue reads, “The Spirit of Radio”.